My garden encroaches on the poor, defenseless sidewalk. Am I the only gardener who can't see a path without wanting plants to grow over the edges? This is one thing that drives my partner, Norm, crazy. He would much prefer all plants to remain on THEIR side of the border. I want them to spill over...just a bit. Of course, some years (like this year), weather contributes to create more of a tidal wave's worth of spillage, rather than the gentle ebb I had intended. It really does prove to me that, in the future, I should plan on a minimum width of 6' for all paths in any garden I plant. Restraint, it seems, is NOT my strong suit. Luckily, I live in Portland...and believe it or not, my garden isn't even close to being the most "overgrown" that I've seen. Even just a few blocks away, someone has a huge Fig tree planted in their parking strip...which makes the sidewalk nearly impassable once it leafs out each year. Of course, by the time Summer rolls around, you wouldn't want to walk under it anyway...because of all the fallen, fermenting figs that litter the sidewalk. Now...of course, if any of our neighbors ever voices a safety concern, I'd cut things back (after trying my best to change their minds). Luckily, so far, I've never gotten anything but positive feedback about my GARDEN GAUNTLET OF AWESOMENESS from all the people who walk by (and we live in a very "walk-y" neighborhood). What do you think...eyesore...nuisance...or valuable & beautiful resource to be treasured and cherished by all who encounter it? I vote for awesome. Beautiful spillage the way it looks in your picture, but any more and I would recommend a little tidying. Not much, though, just enough so people can easily walk through your gauntlet of beauty. The way it all softens the passage is lovely just as it is. Me too!!! I'm actualy planning on cutting back the Geranium on the left a bit this weekend...it's sprawling quite a bit, and totally open in the center...needs a little "freshining up"! Eyesore? Are you kidding? No way. More like eye-catching. I think as long as there is some sidewalk--and you've got plenty here--then it's fine. You know what I don't like? Plants that spill onto a lawn. I've got a lazy Phygelius that, to its own demise, is flopping right where the lawn mower is supposed to go. Not good. However, as long as the pathway is still passable, like it is here, then why not have a little fun? Garden whimsy all the way! Oh yeah...that's a huge pain...and probably why I keep whittling away at what little reamins of my lawn...I don't have the patience it takes to keep pushing those wandering plants back! Whimsy FTW! I say it's fantastic. Love the look! Yay...glad you like it, Sue! I like it the way you like it, but my hubby doesn't like spillers either. Extra wide paths seems like a good compromise. I agree...it's definitely good to be able to plan for such things, right? Oh my gosh, it's a valuable and beautiful resource, of course! I'm so jealous! Everything around here is brown, crunchy, and dying. Please do a rain dance for those of us in the Midwest. I like an overflowing border, too, and my husband always wants to cut it back. Argh. LOL, this could be me. 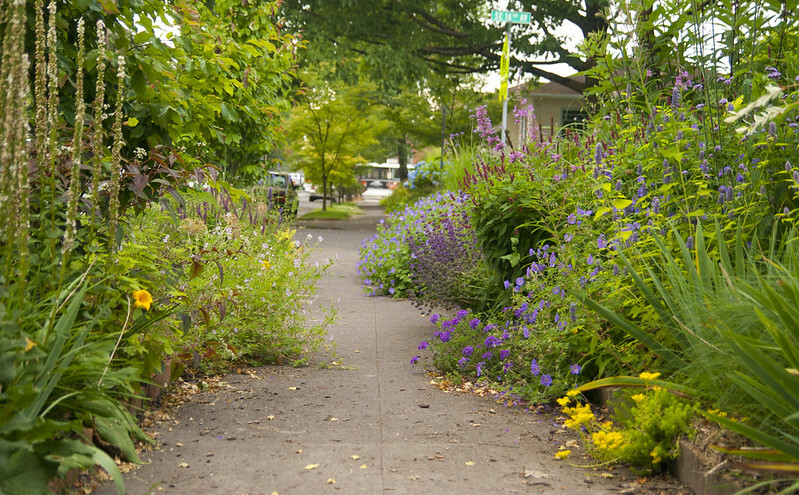 I love it when plants start to spill over onto the sidewalk (yours is gorgeous) but people around here can be a bit persnickety so I do some trimming occasionally--once or twice a year :-). Hehehe...yes, I think mine is approaching the "trim-needed" phase of the year! It's beautiful just the way it is! Plantings like this help to soften the edges of urban life and for just a moment while walking through your lovely garden, one can be pulled away from concrete and into a calming oasis. When my sidewalks look like this my lovely city sends me nasty grams telling me to cut back the vegatation from my "nuisance property" or face a fine or worse. GRRR! That's my thought, EXACTLY! I love feeling like for the brief time people walk by, they don't feel like they're in a concrete jungle anymore :-) I'm so glad our city (and neighborhood) is very lax about such things. In Abq, people just walk on the streets (wearing dark colors at night, too), since nobody maintains all the native grasses, shrubs and cacti in the parkways. And with rattlers, scorpions and centipedes hiding, it just encroaches in crunchy glory. Norm...could be worse! I love spillage too, I think your photo shows a beautiful garden. There's still room to walk through without either getting grabbed by something, or worrying about stepping on your plants. I really don't see a problem, there is still scads of space for people to walk in! It's lovely! This kind of garden is about lush beauty not geometry and straight edges. Save that for Versailles. Absolutely, couldn't have said it better, myself! Exactly, Cher, if it were really making walking hard for people, I'd cut it back...but as is...not a chance! It's not drill, drill,drill as the republicans chant, it's spill, spill,spill. Keep 'em unbridled, Scott. That's for sure, Alan. I actually do think I need to cut back the Geranium on the left quite a bit this weekend...it's far too sprawly and open anyway, and a good trim will be beneficial for it. The city made me cut my shrubs back beyond the sidewalk after a neighbor complained. I knew who it was, my new neighbor behind me whose first act upon buying his new house was to come onto my property and trim back (cut down) a weigela near his front entrance. Confrontimg him he claimed ignorance as to the property line, but the flags were still up on the mandatory survey. I was so glad he moved. OMG...seriously?!? I would be glad to get rid of that neighbor too! I'm really very fortunate that all our neighbors seem to actually enjoy the garden enough that they don't complain. We don't have hell strips in the UK and I think the pavements are poorer for it. Yours are great, you are reclaiming the streets! That's so funny...I sort of take them for granted, and didn't realize you all don't have them there. I agree...even when they are wasted on turf, they provide a necessary buffer between cars and the sidewalk. I love spillage! We have neighbors that grow artichokes in their hell strip and it's gotten a little precarious to walk on the narrow sidewalk . . . but I still think a full garden is worth it. Everything looks so lush! Your spillage is lovely, and is safer than my pokage. Meaning, eye-level plants that poke out over the sidewalk sometimes. I think your knee-level spillage is gorgeous and makes for a lovely walk through. We had neighbors who had a beautiful spillage of lavender up their front walk. They received a notice from the post office saying unless they cut that back, their mail delivery would end. I think the bees were a problem. Yikes! I've actually been poked a few times, myself by other's gardens too..hahahaha! I guess we're lucky that our mailman doesn't mind bees...they'd definitely make us do the same! The only problem I see with this is people and papparazzi coming from all over to experience it for themselves. Well as a gardener I have to vote for just gorgeous and love them spilling over. You did such a good job of planting that hell strip Scott. Now if we both had a pond to grow some Lotus in. LOL! OMG...I know...where are our ponds!!! Your picture reminds me of the Grand Allee at Giverney. By the end of the summer the nasturtiums growing from the opposite edges of the walk have met in the middle. Your garden is glorious - Monet would be proud. OMG, Jason...that is exactly one of the things that inspires me, directly. I found a book about Giverny years ago...and I think it's informed A LOT of my gardening decisions since then...obviously, some things I'm not even conscious of...but there you are! I vote for spillage, what a difference to my day to be greeted with a beautiful tumbling display like this. Exactly...it's so much more welcoming! You should see my spillage or semi-blockage. He he. I'm concerned with vertical height on my corner now. Ahhh...yes...that's something I'm definitely being wary of, as well...I don't want to be the cause of any traffic accidents, for sure! My husband is always wanting to trim things back away from our sidewalk! I generally let him have his way with the menacing barberry bush, but when I see him head toward the rhododendrons with clippers in his non-gardener's hands, I get heart palpitations! Oh no!!! I'm the same way...he can trim the Laurel all he wants...but stay away from the perennials, please! The sidewalk is suddenly a romantic garden path--I love it! To me it's beautiful, but then I'm so unqualified to comment. We have these very same disagreements at home, that I don't respect boundaries, etc. I love plants surging up around and occasionally burying the hardscape, but I understand and respect Norm's objections. It's quite the fine line you'll have to walk! Looks great to me, interesting and diverse,Nature doesn't like straight edges anyway. I wouldn't mind it personally, but I can understand that it could be a frustration to some people. I get annoyed by branches over-hanging walks at the 5 or 6' level. Especially 6'... I don't always see them if I'm not paying attention to what's in front of me, which is often! That's a good point...and one of my pet peeves...I've gotten poked in the eye a few times by badly-placed shrubbery! I guess I'll have to be a dissenter here. It's lovely to look at, but if I were your neighbor I'd be asking you (with much regret) to trim it back. I do a lot of walking with a stroller, and now with an ambulatory child. It would be difficult to navigate that with a stroller, and the plants would hit my walking daughter in the face (I know because it happens all the time, though around here the sidewalks are overgrown with weeds not flowers). I'd also think it would be difficult for someone with physical limitations (like a person with a disability or an elderly person). Sorry to be a downer, but sidewalks are important. So many people think that passable = passable by an able-bodied adult, and fail to consider those with different needs. It is a beautiful garden, though. And I totally envy your awesome picture-taking skills. Larry doesn't like spillage, either, but he can tolerate it if I keep things trimmed a bit. When I looked at your photo, I saw exactly where I would trim things up so that you would still have some softness, but not have as much of the sidewalk covered. I would walk by your garden every day if I lived in your 'hood, Scott. Absolutely stunning. Defiantly beautiful! I love full gardens that seem to spill out of the beds.